Star Trek might be the ultimate nerdy franchise not because it’s about space exploration, spaceships, and science, but because really, it’s a TV series about a group of people who really love rules. And they love them because those rules bring with them a bountiful, idealistic utopian society. But lately, no one aboard the Discovery seems to care. “The Sound of Thunder” is an episode primarily about characters trying to find the people they used to be, and wondering if coming up short actually matters. Part of this is pondered briefly by Doctor Hugh Culber, who finds himself returned from his nightmarish half-existence in the Mycelial Network not just alive, but literally renewed—given an entirely new body by his experience that is in tip-top condition and so raw it’s not even fully used to being an actual human body yet. For most people, and at least from the perspective of Stamets (who is remarkably giddy to have his partner back), this would be a good thing, but for Culber, there’s a sense of loss that he can’t quite grasp yet. He’s alive, and yet the body he experienced all he knows in, is gone. He has this new form, one that does not have quite the right sensation, one that does not have the literal scars that would come to define some of the biggest choices in his life. Which makes him wonder: Is it really him? However, the episode mostly tackles this theme through Saru, who also went through some pretty major physical changes that have both himself and his friends starting to question just what Saru is becoming. His lack of fear-sensors has brought with it a more dominant personality—one that finds itself immediately brought to the fore when Starfleet’s search for the red signals brings the Discovery to Kaminar, Saru’s homeworld, which is populated by the sinister, warp-capable Ba’ul and the primitive Kelpiens. 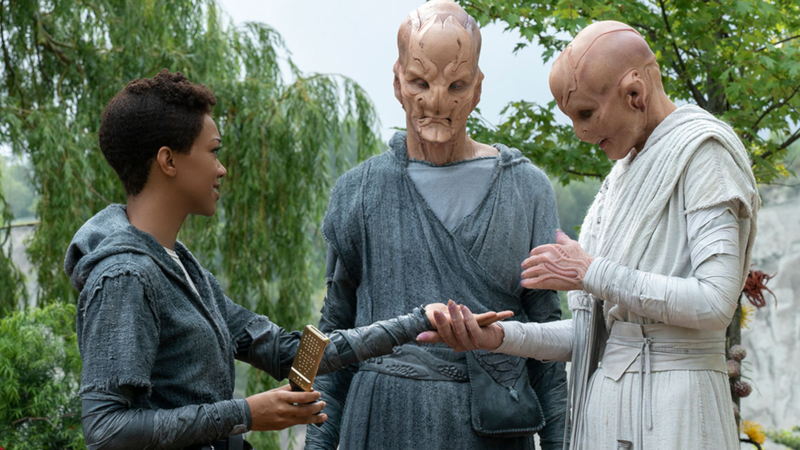 Saru immediately wants to tell his fellow Kelpiens that the biological process they believe leads to them sacrificing themselves to the Ba’ul isn’t actually fatal...but he can’t, because he sacrificed communication with his people to join Starfleet, an organisation that holds highly a Prime Directive not to use its advanced technology to alter the evolutionary progress of pre-warp species, no matter how beneficial it could be. And yet Saru does it anyway, forcing his way onto the mission to go down to Kaminar and investigate the signal sighting (and promptly finding and telling his sister that the act of “vahar’ai” is a biological scam). He openly rebels against Captain Pike’s early attempts at diplomacy with the Ba’ul—the only avenue open to Starfleet that wouldn’t violate General Order One in the first place—hounding them as murderers and cullers. When Pike tries to protect Saru from the Ba’ul’s clutches, he disobeys orders and tries to sacrifice himself to them anyway. It’s aggressively defiant in a way that Saru has never been before, which is fascinating, but at the same time, it’s kind of scary that no one calls him out on the hypocrisy of casting aside an ideal that aspired him to look to the stars and join Starfleet in the first place. But he doesn’t need to be, because he’s rewarded for it. Saru saves his sister, gets to defy the Ba’ul’s machinations, and, with a little help from the Red Angel, he not only gets to forcefully evolve his species into its true form, but do so in a way without repercussions from the wrath of the Kelpien’s former predators. It’s a win all around except for deep within the moral core of what makes Star Trek, well, Star Trek. And really, right now, as good as it has been from an individual storytelling standpoint—and once again, it is so here, with the stuff between the Ba’ul and Saru as an evolved, formerly lost “predator” version of the Kelpien, and the tension between Saru and his sisters all creating some great, classically Trek-ian moral dilemmas—that hypocrisy and lack of consequence to our heroes repeatedly and openly defying the Prime Directive is maybe the show’s biggest problem. Sure, past Trekshows have just as flagrantly meddled with the idea of the Prime Directive, but it’s been out of the desire to override it with a moral obligation to help people in need, warp-capable or not. Here, it’s being overruled because it makes things easier in the hunt to figure out where Spock is and what the Red Angel is. 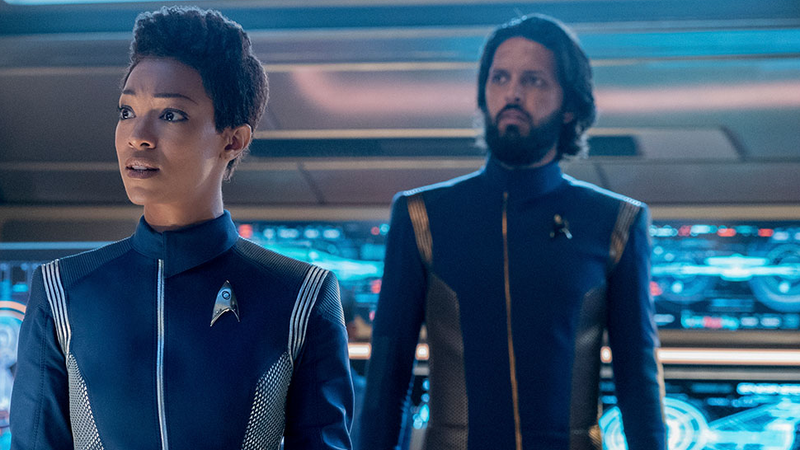 Discovery’s second season is less of a window into this Pre-Kirk era of Starfleet, and more of an origin story explaining how a subdivision of Starfleet as brazenly cynical and circumspect as Section 31 can even exist in the first place. Because it turns out, no one’s actually facing any consequences for breaking the rules that bind Starfleet and the Federation together so far this season anyway, so it’s a perfect breeding ground for the shadowy operations of Section 31. Pike—who still throws out pithy “but what about General Order One?” asides here and then promptly ignoring General Order One to do something—has repeatedly bent the rules so far, from offering technology to the human colonists on New Eden, to re-initialising the Spore Drive, all because it makes the hunt for the Red Signals that much easier. Saru’s flagrant insubordination and defiance of the one thing that elevated him into the stars in the first place is rewarded with being able to kickstart the evolution of practically his entire race (without their consent) and set them up to confront their former oppressors in violent liberation. And then there’s the “Red Angel” itself, which seems to be less of a spiritual phenomenon and more of a time-strewn wanderer deliberately going around crisis after crisis and changing the established course of events, or at least nudging them along enough that other people like the crew of the Discovery end up changing them. But they’re doing so at the cost of casting aside one of the core tenets that makes Starfleet what it is...and at least, so far, there have been no repercussions. If anything, it’s an attitude that’s been accentuated by the arrival of Section 31 on the show, and not even as a mysterious operator in the background but as an open and accepted (albeit a little begrudgingly) entity. After all, why keep the section of your organisation literally created to break the rules secret, when everyone else around them is doing it anyway? Part of what made Section 31 work when it was first introduced in Deep Space Nine was it was this completely alien entity to our heroes—familiar thanks to the trappings of Starfleet but so wildly ethically different, and so wildly secretive, that its very existence was baffling for them to comprehend. For Pike and the Discovery, however, Section 31 isn’t just known, it’s...their co-workers on this mission. It’s just accepted, as part of what Starfleet must be like, even without the pressures of war to act as an excuse for it. And beyond that, it’s rubbing off on them, as no level of interference in the hunt to solve the signal mystery becomes a line that cannot be crossed. And while on the surface Discovery’s second season has been about a story of hope—of finding faith, finding love, finding a sense of humanity in the vast darkness of the cosmos—and “The Sound of Thunder” is no different in that regard, there lies this oddly contrasted cynical heart underneath it, one that bleakly accepts that Section 31 isn’t an idea to be opposed just for its very shocking existence, but rather the new normal. And a new normal that our crew is getting alarmingly used to. 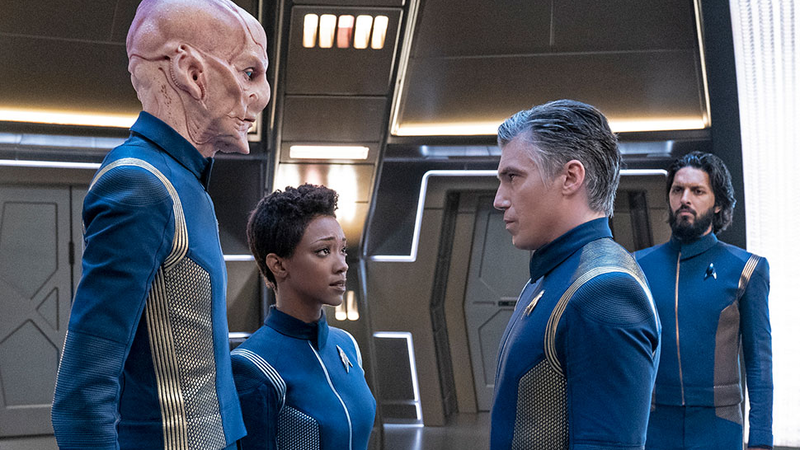 We’ve still got a way to go before this season starts wrapping up of course—they are still Spockteasing us!—so there’s plenty enough time for the other moral shoe to drop on our seemingly carefree crewmembers. But it’s been waiting to drop for a while now at this point. If we don’t see some of this coming to bite our heroes in the arse sometime soon, Discovery is in danger of sacrificing some of its better angels in its hunt to chase down something that might not be so angelic after all.